Want To Know What Alcohol Actually Does To Your Body? Despite how many articles you may have read on ‘the health benefits of wine’, alcohol is not considered a health food. The fact that you wake up feeling pretty lousy should be enough proof of this. While there is nothing wrong with enjoying a drink or two, how much you drink is something you need to be more conscious of – particularly during the silly season. The guidelines in Australia recommend one alcoholic drink per day for women and no more than two for men, however, consuming alcohol in excess is becoming more and more common. Drinking too much during the festive season can take its toll, so here are some things that you may want to consider before gulping down that next glass…. 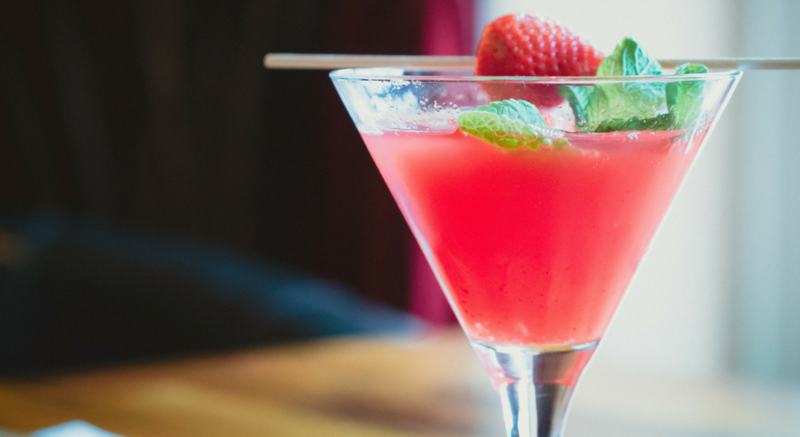 The active ingredient in alcoholic beverages that makes you ‘drunk’ is called ethanol. It is produced by yeasts when they digest sugar in certain carbohydrate rich foods, such as grapes (wine) or grains (beer). Alcohol is a diuretic (meaning it makes you pee more often than you usually would). All those trips to the bathroom strip water and electrolytes from your body, causing whole body dehydration, including skin. Drinking often is thought to deprive the skin of vital vitamins and nutrients and over time can have detrimental effects on your skin. Alcohol can also cause inflammation, resulting in redness (this is why some people look flushed when they drink). It can also exacerbate skin conditions like acne and eczema. Unlike fat, which is deposited into fat cells or carbs that are stored in our muscles and liver as glycogen, the body doesn’t have a storage place for alcohol. This is because alcohol is detected by the body as a toxic molecule. This means the body is forced to prioritise the breakdown of alcohol over the metabolism of all other macronutrients (fat, protein, carbohydrates). In the liver, it is converted into a compound that the body is very efficient at burning and therefore the body doesn’t have to do much metabolic work to burn it up. While our body is burning this off, the body stops burning fat and this can be for hours post drinking. For those that drink regularly, the body starts to recognise alcohol as a consistent energy source and overtime may start to promote body fat storage rather than burning it off. This is where the term ‘beer gut’ comes from, as the most common site of fat storage is around your mid-section. While a small amount of red wine may promote gut health due to the antioxidants, generally speaking, alcohol prevents the growth of good bacteria in the gut. It can also act as an irritant in the gut. Even a small amount can cause changes in bowel habits and the consistency of stools. Even if you are eating the right foods, taking probiotics to look after your gut, all of this hard work can be undone if you go overboard on alcohol. Drinking alcohol can stop protein synthesis (i.e. your cells stop producing protein). This can be detrimental if you are looking to gain lean muscle mass. The research shows that regardless of how much protein you consume, if you drink within 8 hours of exercise your muscle protein growth is impaired. Alcohol is classified as a depressant. This doesn’t necessarily mean it makes you depressed (although it can have this effect), it means that it slows down messaging in our brain and the reduces levels of important neurotransmitters, such as serotonin (aka the happy hormone). This is why people often slur their speech and are less coordinated. Heavy drinking can even lead to a blackout resulting in memory loss. While in the short term alcohol may boost confidence, over time it is more likely to increase feelings of anxiety. The dehydrating effect and increase in heart rate can also exacerbate these feelings of anxiety. Order your wine by the glass so that you can keep track of what you’re drinking. This means you won’t feel like you have to finish the bottle. Try and make sure you are well hydrated before you start drinking. This will ensure you start with a full dank and might help prevent you from drinking too quickly. Since alcohol strips water from the body, an easy way to prevent dehydration is to keep drinking water all night. Don’t use alcohol to quench your thirst – make sure you opt for water for this. Drinking water in between beverages will also help reduce the severity of your hangover. Choose soda as a mixer rather than tonic or soft drinks which are laden with sugars. Soda will also help keep you hydrated as well. Choose ‘low strength alcohol’. 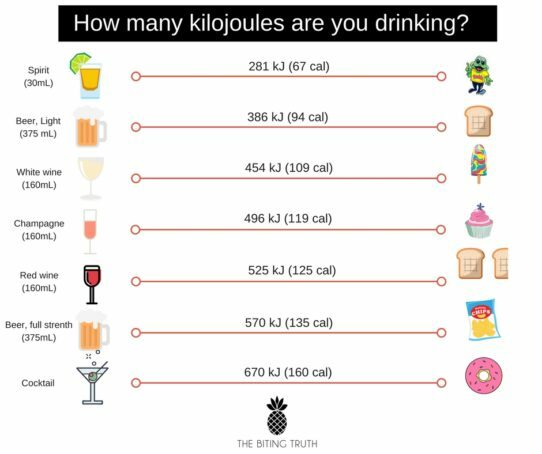 Don’t be fooled by ‘healthy’ or ‘low carb’ drinks, as it’s the actually the alcohol content that contributes the most kilojoules, not the carbohydrate. We love a glass of wine (or three!) and believe that if you enjoy alcohol and can keep it moderate then by all means do so. Alcohol can be part of a healthy lifestyle – it just comes down to moderation. For more articles about healthy living, click here. For more information, see below links.